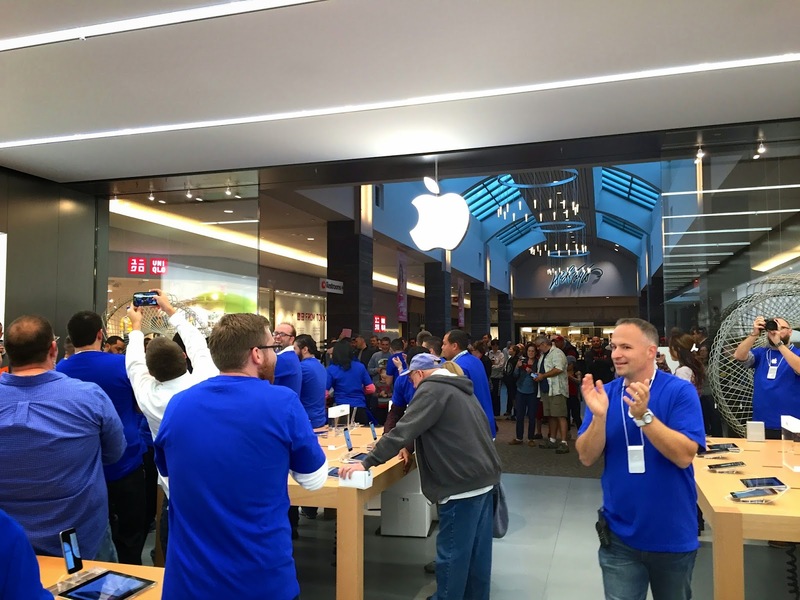 This weekend, Apple opened another store in Connecticut, this time in the well known Westfield Shopping Town, Trumbull mall. My father and I were just crazy enough to get out of bed early on a rainy Saturday morning to stand in line to celebrate the opening of the new store - and to score free t-shirts! We arrived at the mall at about 7:35am. It took us about 10 minutes to park the car and make our wall through the virtually empty, cavernous mall. As we turned the corner we could see the security guards standing around and knew that the new geeky playground was just ahead. We took our places, twelve and thirteen, in line. 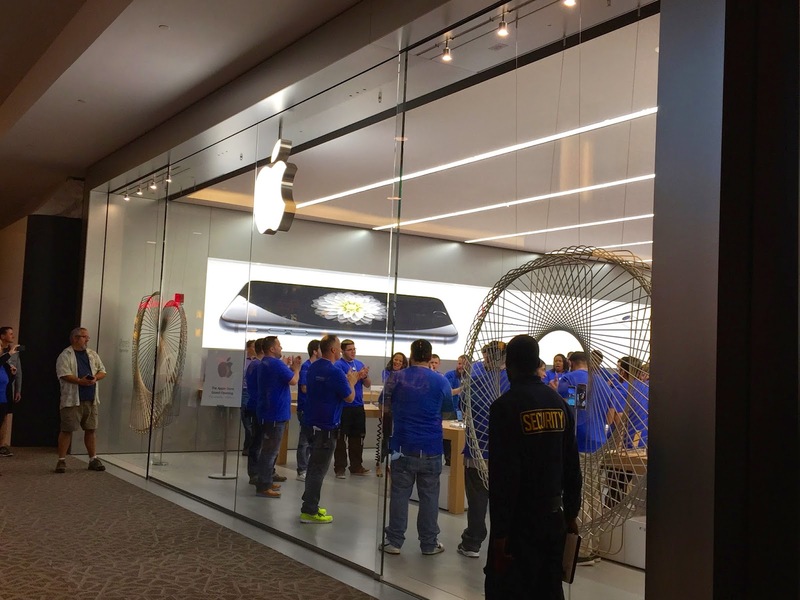 As you can see from the photo above, the store looks identical to all of Apple's other in mall stores. 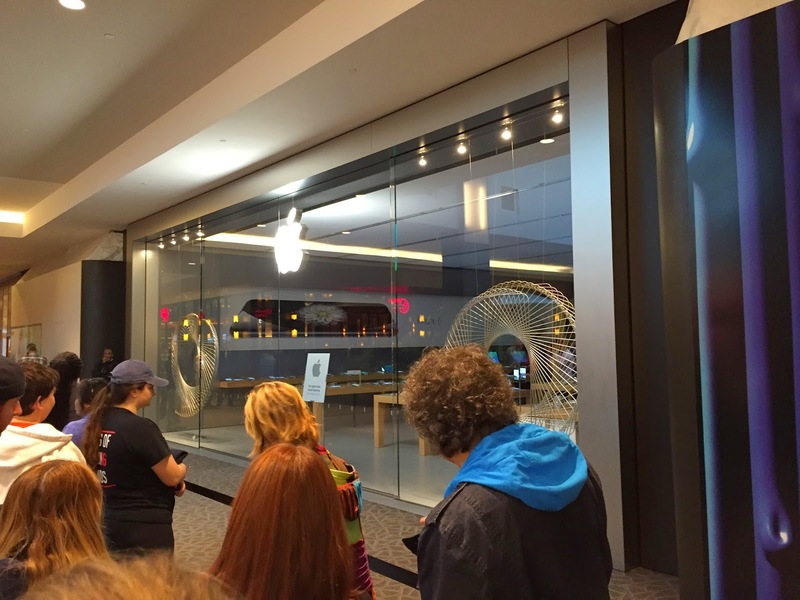 There where several points during the morning when the Apple Store employees would come up to the doors and check out the growing line. We started taking them pictures of them and they did the same to us! 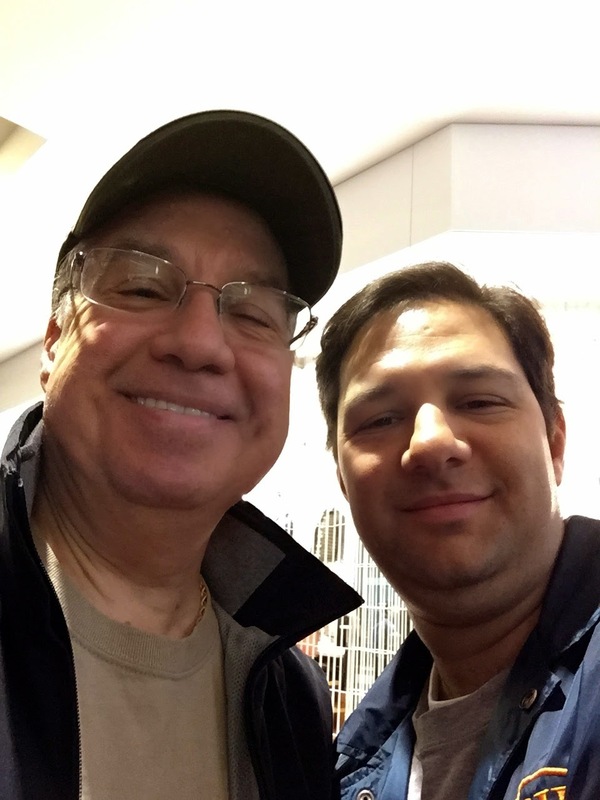 To help past the time, my Dad and I started taking more Apple Store selfies. My daughters have informed me that we are definitely not cool. By 9:40 the line had gotten pretty long. 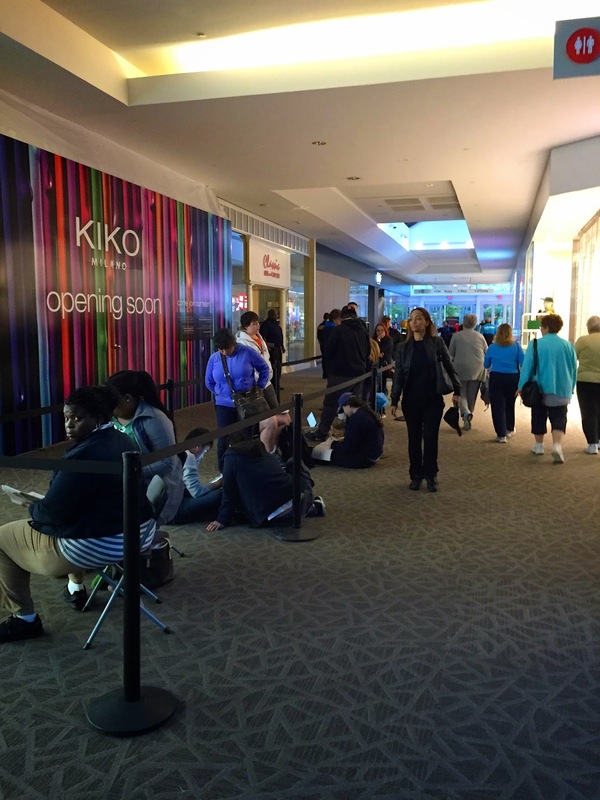 While it looks like the line only goes to the mall doors, the line actually breaks to keep the doors clear and then continues down the hallway to the left. 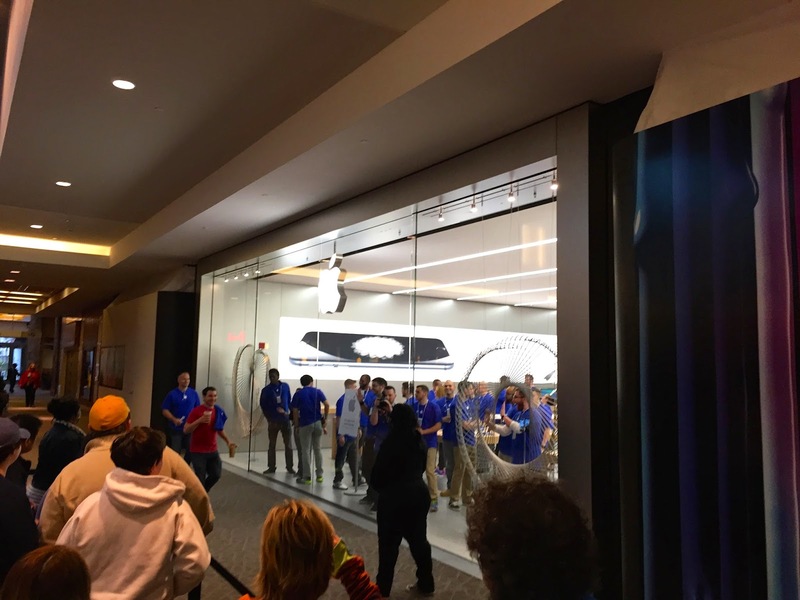 The staff really started getting psyched up in the final 15 minutes before the store opened for business. You can see from the picture inside that the main house lights were turned off and that something was being projected inside (You can see a reflection of sorts on the ceiling). 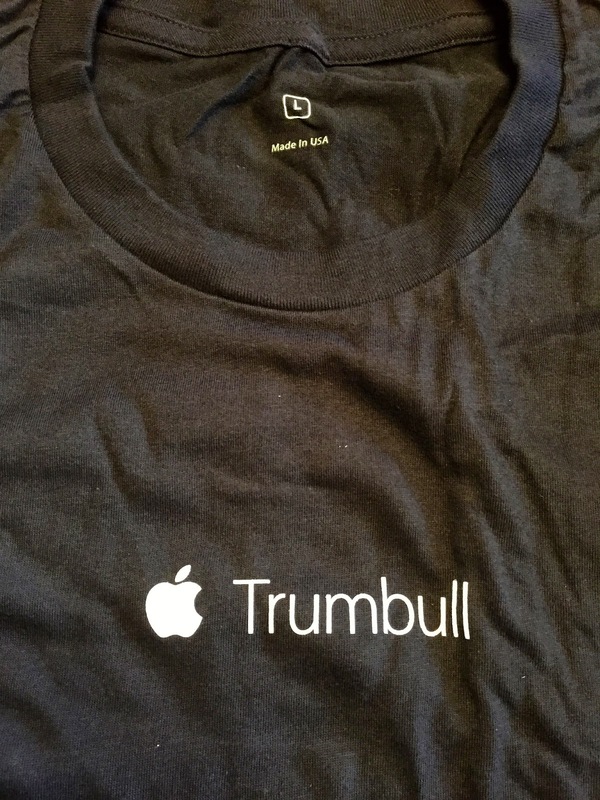 Just before the lights came back on you could hear the staff getting super excited - clapping, whooping and chanting "Trumbull, Trumbull, Trumbull!" All of this got the crowd that was gathered out side super excited. Everyone who had been sitting on folding chairs or the floor was now standing with anticipation. The people in front of the line had big smiles on their faces. We couldn't hide it. 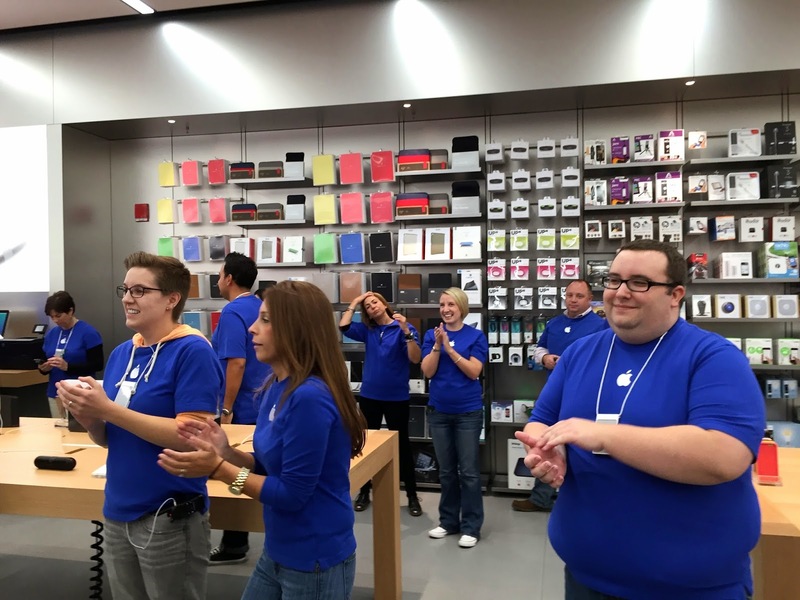 I don't know what special magic is contained in the Apple Retail Store employee handbook, but I do know that whatever is says about the procedure for launching a new store and getting customers excited to go in and spend their money was clearly, clearly, working. 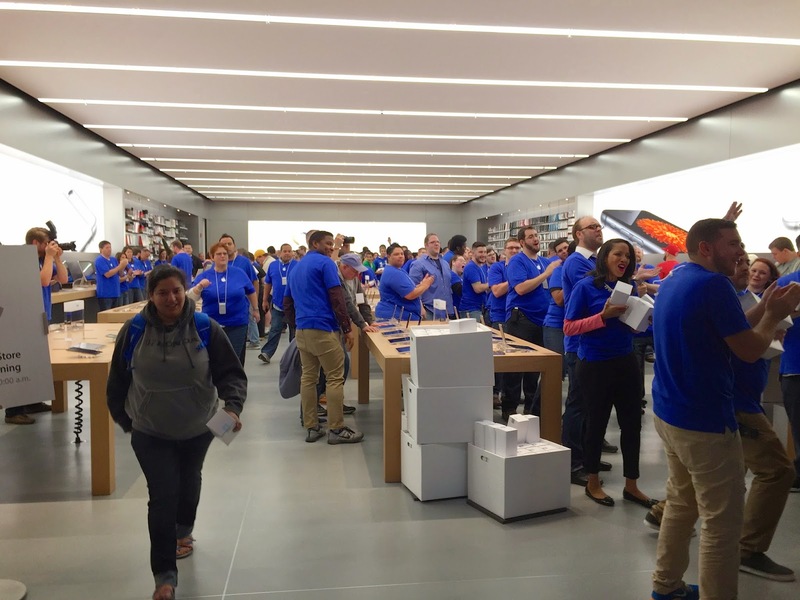 Seconds after the lights came back on and the chanting stopped, the employees exploded from inside the store and started running down the line high fiving the customers who had been standing in line for hours. 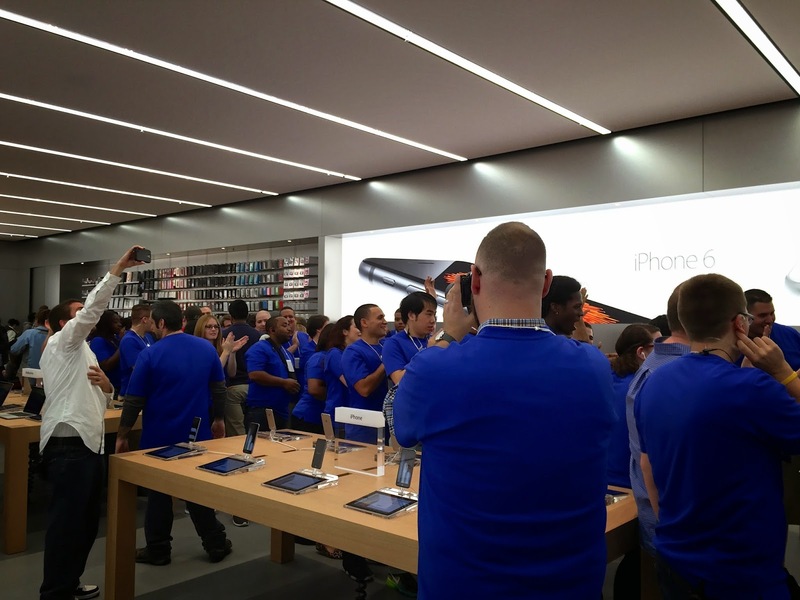 It was hard to remind myself that this was the opening of a high-end electronics store and not the pep rally just before a high school football game. Once back inside, there was one more last minute team meeting and then the doors slowly began to part and lock into their open position as the crowd heard the familiar 6...5...4...3...2...1... and then everyone lost their minds and went nuts with an excitement - an excitement you can watch in an Apple keynote but just don't understand until you've participated in it live and in person. 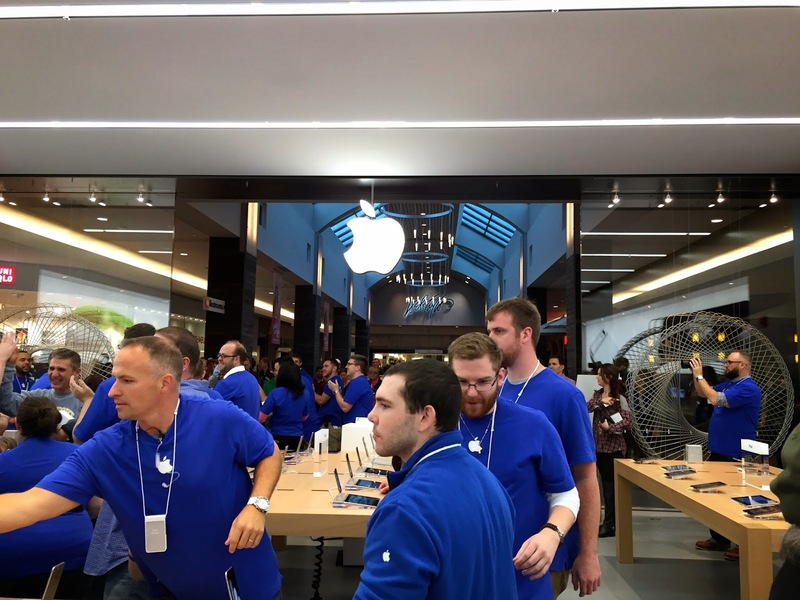 Once I got inside, the store was instantly flooded wall-to-wall with customers, employees, hardware and what I can only describe as amazing party atmosphere! As we all poured in there was even more shouting, clapping, and high fives for everyone. 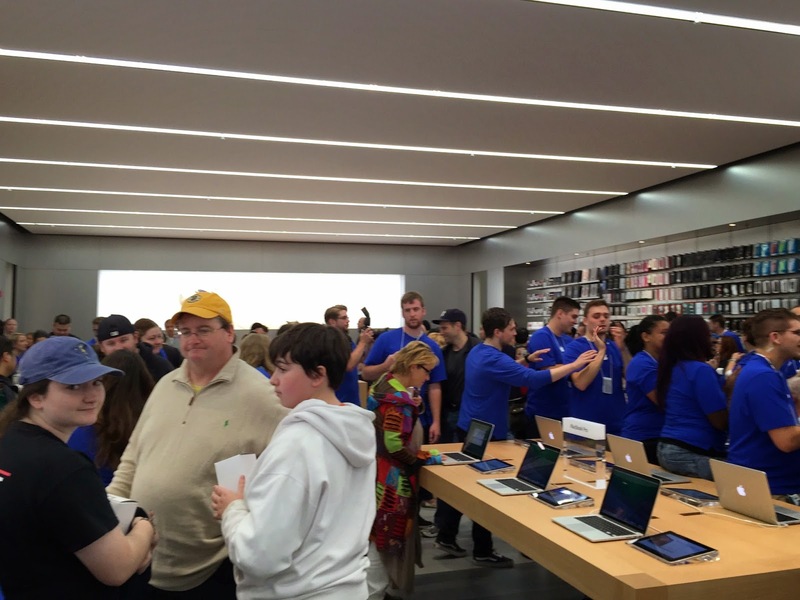 Store employees where handing out special commemorative t-shirts and greeting customers with warm hellos, welcomes and smiles. 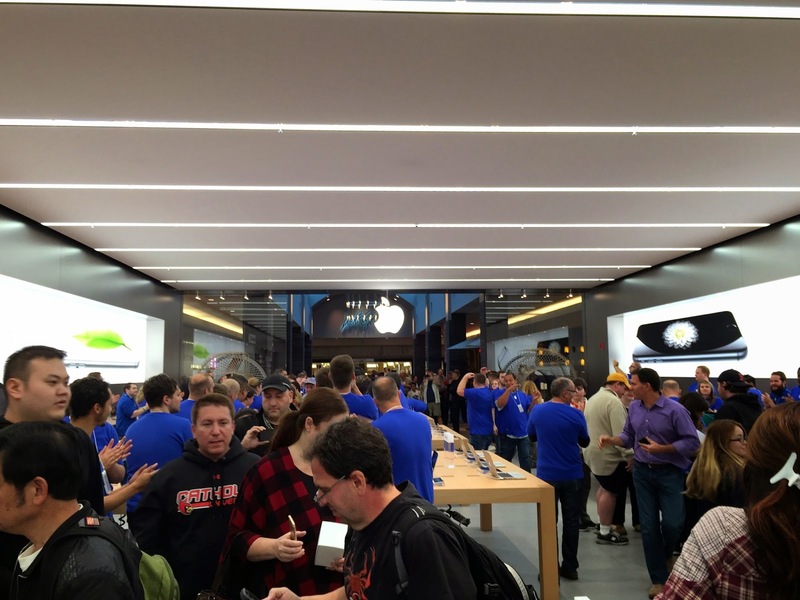 I can't adequately explain the excitement of being at the launch of an Apple Store. 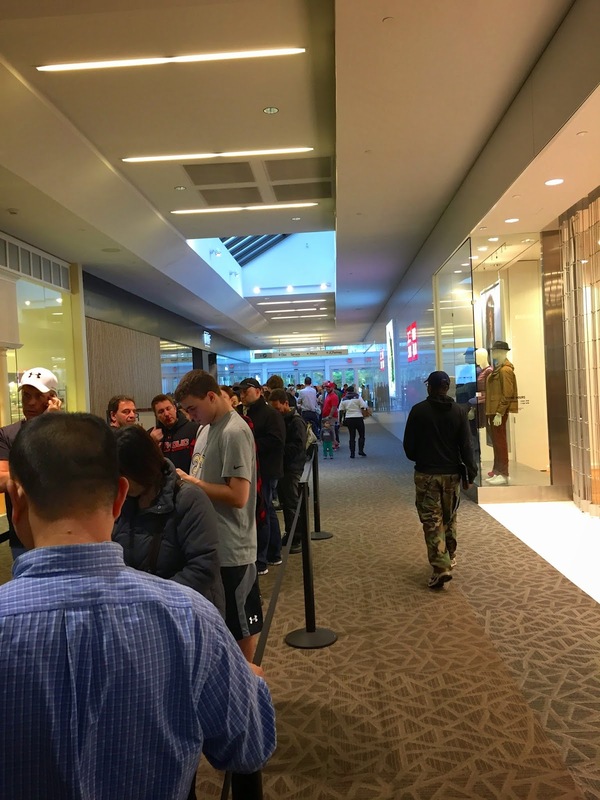 Being a major tech nerd, my family expects me to wait up late at night to buy the latest shiny new gadget, software (boxed or download - yes, I was at the midnight launches for both Windows 98 and Windows 98: Second Edition) or get up early on a day I should be sleeping in to go stand in a long, long line. This time, I knew it was worth it from the smile on my Dad's face. 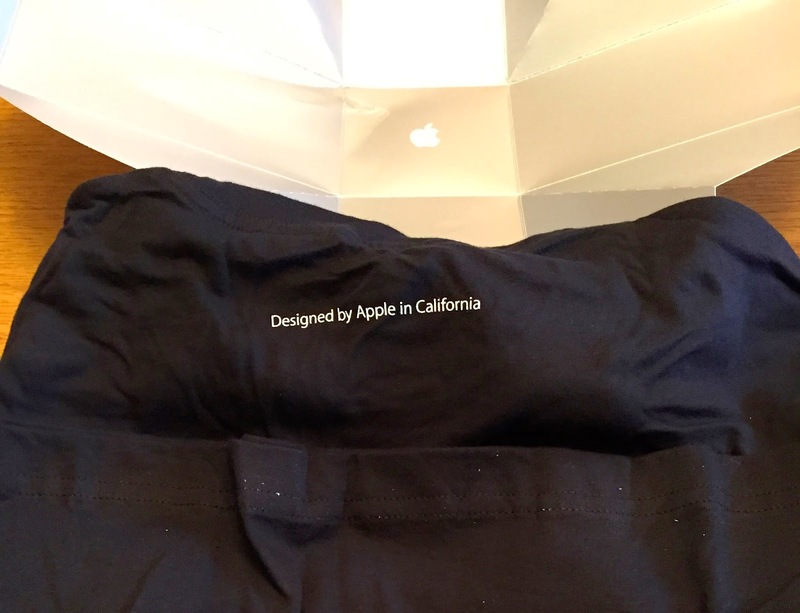 And while I was one of the lucky first 1,000 people to get a free t-shirt, I just couldn't leave the Apple Store without picking something up, so my iPad Air, which I had with me, went home with a new black Smart Case to match the black leather case on my iPhone 6; which I was using to shoot these pictures and video with. 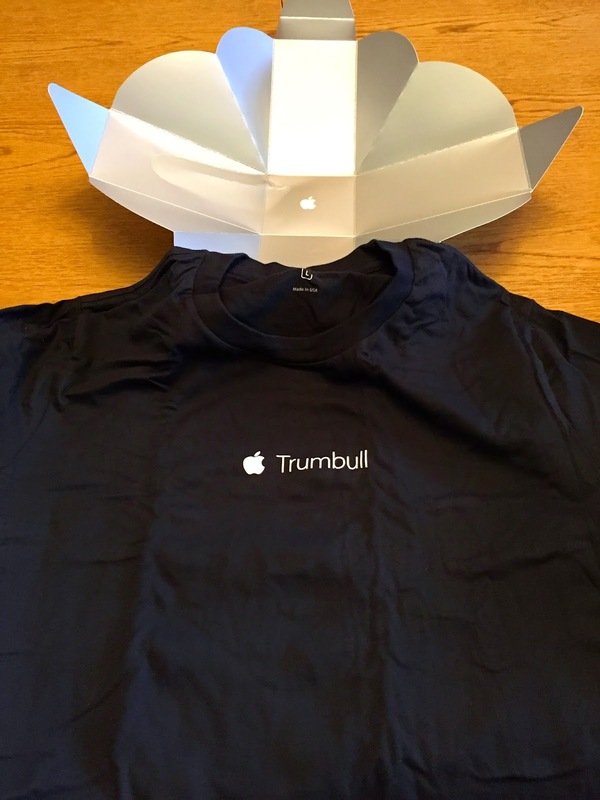 Once I got home, I unboxed the t-shirt. 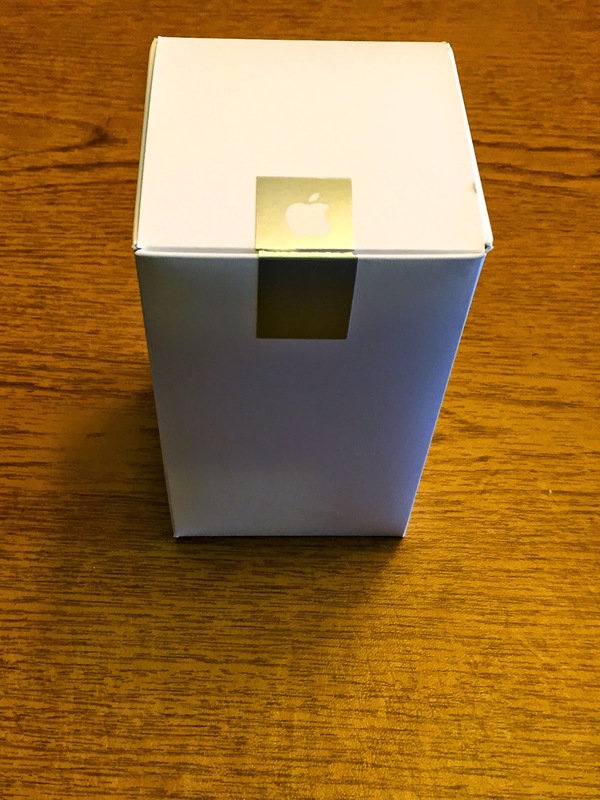 I almost forgot to take the unboxing photos as evident by the cut in the box's silver tab seal. 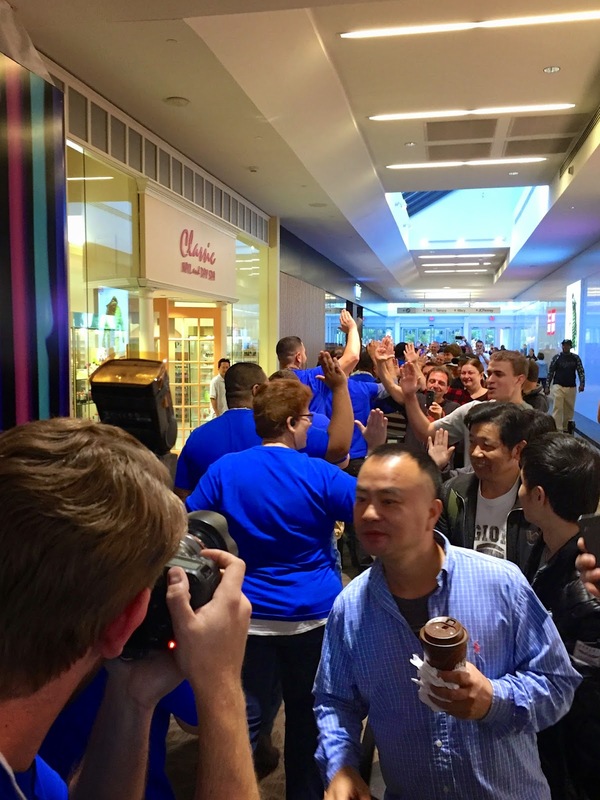 It's not every day that you get to buy a new major piece of hardware, such as an iPhone 6, or are able to be literally one of the first two dozen people to walk into a new Apple Store. 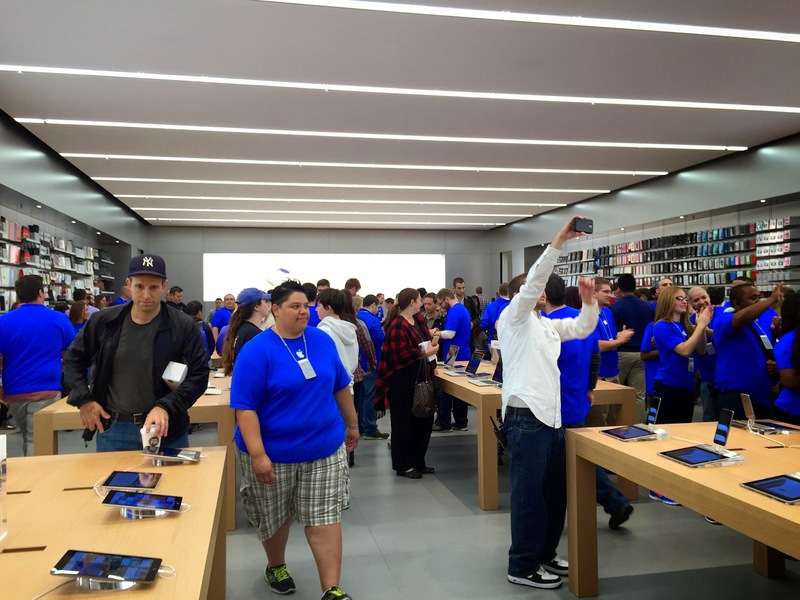 If you get chance to go to a product launch or a store opening, you should do it. 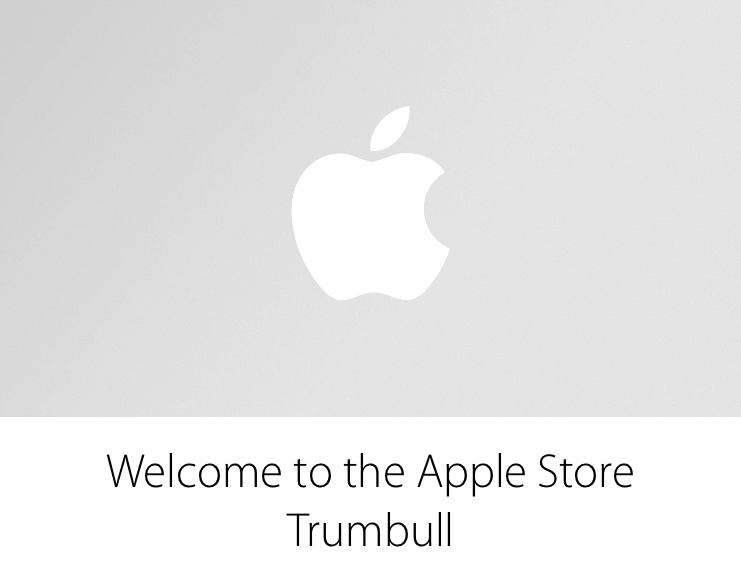 Even if you aren't an Apple fan boy, clearly I am, or a tech nerd, or don't know everything about Apple's stuff. 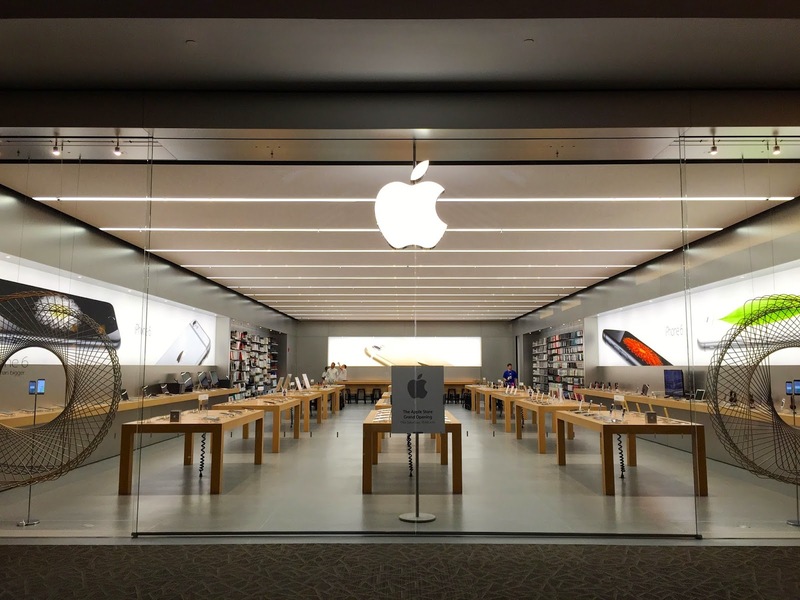 It's a pretty amazing experience to hang out with other customers, fans, and staff who truly "get" what makes Apple's products so amazing, transformative, and simply delightful to use.